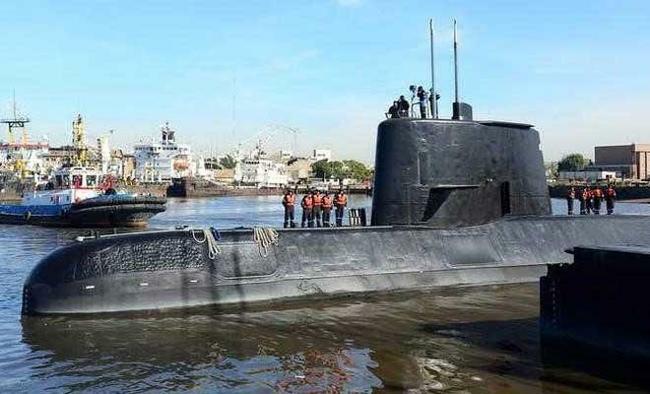 Buenos Aires: The Argentine Navy has confirmed that a noise detected in the South Atlantic area, was not from the ARA San Juan, a submarine with 44 crew members on board which disappeared last week. "That noise was analysed, the acoustic signature, and it does not correspond to a submarine, to a pattern of what would be hull blows in the Morse system, it is a continuous, constant noise, which could be biological noise", Navy Spokesperson Captain Enrique Balbi said in a statement on Monday here. It was reported Monday afternoon that several boats participating in the search of the submarine detected a "noise" that could belong to the missing vessel some 360 km from the Valdes Peninsula in Argentine Patagonia, where the Atlantic Ocean has an average depth of 200 metres, reports Efe news. The area coincides with the path where the missing submarine, which embarked from the southern port of Ushuaia, was supposed to pass it made its way back to the base in Mar del Plata. A US Navy submarine-detection aircraft, which had been deployed in the area where the sound occurred, recorded the noise and sent it to the search and rescue coordination centre at the naval base for further analysis, which then concluded that the noise did not bear any link with the missing submarine. However, the Navy spokesperson said that it is going to conduct a thorough search in that area, taking advantage of the two research vessels of the Navy and a Brazilian polar ship, so as to make sure that noise was really not from the missing submarine. The Navy announced on November 17 that the missing submarine last reported its position at dawn on November 15. After a reasonable period of time without communication with the vessel, the Navy decided to activate the search protocol in the late afternoon of November 16. On November 18, the Ministry of Defence said that satellite calls registered on that same day could have come from the missing submarine, but the Navy later denied such speculation on Monday. Argentine President Mauricio Macri travelled to Mar del Plata Monday morning, where the submarine's base of operations is located, to monitor the situation and support the families of the crew members on the missing submarine.